The colourful world of Kristin Nicholas. Keep up with life on the farm, buy some fresh and tasty lamb, or register for one of Kristen’s workshops. Images of Kristin’s amazing farmhouse are here. Leave a comment below to win an assortment of Color by Kristin yarn, from Classic Elite Yarns! UPDATE: Thanks to everyone who left a comment. We have a winner! Music by Doug MacLeod, Sheep of a Different Color, from the cd The Utrecht Sessions. UPDATE: There appears to be a problem with this episode. I’m aware of it. Some people have been able to get the file, others are getting a 404 message. Things were working fine this morning, and a few hours later they weren’t. I’m trying to chase the problem with Libsyn. I’ll keep you posted. I am, alas, something of a scardey cat when it comes to color. I’m fine with one color, I’m even fine with skillfully-designed, beautifully-dyed variegated yarn. But putting two colors together…at the same time…that tends to scare me. I’ve got (one of my only) multi-color projects on the needles now (wee hats for friend’s new kids). But even so, I’d never have done it for myself, it’s only ok because the pre-walking set isn’t known for their restraint with color. But if anything’s going to get me doing it properly, I think Kristin’s lovely work might be the answer. Or remaining scared and timid could be the answer. But it so rarely is the right one, I’m willing to try. Can I have that colorful yarn? I promise to be fearless with it…..
And beyond the bright and perceceptive observations on knitting, yarn, travel, color, people, I get a whole piece of music at the end of the podcast — music I would otherwise never have heard! Where do you find them? Now I’m going to the Utrecht Sessions . . . Sorry about the incorrect email address — iPad was in TMI mode. Same here, Melissa. I get the big ol’ 404. I’m enjoying this series and am looking forward to seeing Kristin’s new yarn. I had a moment of confusion when I saw the photo of Kristin’s living room, as I’d already seen it on her blog… AND showed it to a bunch of people because I love it so much. Kristin’s color sense is instantly recognizable and I love that about her stuff. I’m envious that you saw her place in person! Color is half the reason I started knitting. Thanks for the chance to win! When I try to download I get CO121-120907_mp3 instead of the mp3 appearing below on “file type.” I can’t download it either. Nice episode! I absolutely adore Kristin’s sense of color. I loved “Julia” yarn so much that when it was announced that there would be no more, I went to WEBS and ordered SO MUCH yarn that I could knit almost forever…. (Not really forever, but you know what I mean.) So now I’m glad that her colors/yarn will live on! Maybe I can even dig into that stash and actually knit something without worrying about never having it to knit again…. I always love to hear a new episode! I have long admired Kristin’s color sense. I’m hoping that I have the nerve to try putting some interesting colors together from her collection, soon–perhaps a pair of gloves. I would love the opportunity to try out Kristin Nicholas’ new yarn; it is an attractive color palette. I’m color challenged and could use a dose of Kristin’s color sense. So good to hear from you, Brenda! Kristin’s living room is gorgeous! I can be brave with color in my knitting, but I wish I was that brave with color in my home. I have been a long-time fan of Kristin’s work. Her gift with color is so inspiring. Since reading her first color book I have avoided white and black to push me into more mixes. I haven’t ventured into the embroidery, but love it when I see it. Thanks for the episode. I adore color but am only recently getting brave enough to play with it. The pictures of Kristin’s house are frighteningly beautiful. My knitting tends to be in all shades of OMG COLOR. Mostly in purple, because it’s the best color. Elsewhere, though? Not so much. My apartment is all earth tones and sage green, except the kitchen and bathroom. They’re both very vibrant. Balance, I guess? Love your pod cast! Can’t get enough of it. Looking forward to knitting with color. Brenda so nice to have you back. Missed you! I could use that colorful yarn as I’m going to Wisconsin at the end of the month on a pilgrimage to the home of Elizabeth Zimmermann and Schoolhouse Press. Taking a Two Color Workshop with Meg Swansen and Amy Detjen! Am beyond excited! #1 on my”Bucket List” ! So even though I have enough yarn for the next three lifetimes, more is always good. Wow, the picture of her living room is a riot of color. I would love to see her yarn. So glad the problem was fixed and I got to listen to this podcast today! I already follow Kristin’s blog and I really like how honest she is about sheep-raising. Lovely episode. I am terrible at picking colors, but am trying to venture into the idea at least with some colorwork kits for small project. Mostly mittens. I dream of the day I can do a fair isle project with colors I picked myself though. So much knitting to do! So little time. I’ve read Kristin’s blog for years and admire her talents and hard work immensely. I hope to get to one of her color workshops someday. Her yarn colors were gorgeous with Nashua and I’m sure the new ones are as well. This was a great episode, so fun to listen to! Thanks so much for the giveaway, sounds awesome! So good to hear your voice. I was one of those who tried in vain a few times to get the download this morning, thanks so much for getting it fixed. I loved hearing about the Kristin’s farm and the realities of working such a large herd. I love the variety and vibrancy she brings to her work and am happy to hear about the return of her yarn line. Excited to hear about next weeks post-card as well. Thanks so much for contest giveaway and for making this Friday a little better. Loved hearing the sounds of farm, wish I was with you. Great podcast keep up the good work. Kristin’s house is gorgeous. I’d love some of that color. Thanks! Would love to win some of Kristen’s yarn – tks for the opportunity! This was the perfect episode to listen to as I drove through the Virginia mountains. I would love to see her farm! Maybe Kristin’s yarn would love to end up here in Oregon and the colors might scare away the winter rain. Oooooo! Kristin has the BEST way with color. So bold and out there. Hearing about colorful yarn and life on a farm was exactly what I needed while feeling a bit stuck in suburbia. Thank you, Brenda and Kristin. Love your podcast. Always- calm, thoughtful AND thought-provoking. Loved this episode Brenda. Oh to live on a farm with all those animals. I’ve been a fan of Kristin Nicholas for a long time. For a long time, Classic Elite Tapestry yarn was my favorite. Next up was her Julia yarn. I am so, so, so glad that Classic Elite has Color by Kristin. If I had to pick one yarn to knit with the rest of my life, it would be Kristin’s. It’s so nice to work with and the colors are magnificent! I promise to put any yarn to good use!! I have been a long time admirer of Kristin Nicholas’ work! I would love to get my hands on some of her yarn! I just love the Color By Kristen yarn and will certainly be adding some to my stash whether I win or not!! Enjoyed the interview, Brenda. I’ve been a Kristin Nicholas fan for a long time, and recently discovered her Kid’s Embroidery book. Nice music for this podcast too! Thanks for the chance! Yes-growing your own wool is hard work. Have you read Sheepish? It is funny, but a very serious review of how hard it is to raise your own. Ooh, goody bag! I have been afraid of color work, though I’m really good at lace and cables. Pretty colors of yarn would be just the thing to kick me in the behind and get me experimenting with color! You do such a nice job getting the feel of a place through with just your words and a few sounds. Thanks so much for doing what you do, Brenda. I’m a colour-lover — a knitter (50+ years), embroiderer (ditto), and quilter…I don’t know Kristin’s yarn, but I’d love to meet it! Great interview with Kristen! I love her blog, and it was great to hear her voice. Also, I love the song at the end, Sheep of a Different Color–gonna buy a copy! Great episode. Thanks for keeping me company. So many great comments already about such a wonderful interview- all I can add is gee I’d love a chance at that beautiful yarn and best of all while I was listening and you said “if you’re cold – put a sweater on….” I did feel a chill and grabbed a sweater – I <3 sweater weather! Thanks for this interview, it lead me to Kristins blog and books. I LOVE her colourwork, stunning! I love listening to your podcast and really enjoyed this postcard from your trip to the states and Kristen’s farm. My ears really perked up when she mentioned the weekend retreats as I’ve been looking for one to run away to! Too bad it’s so far away from Oklahoma! I would loveto try her new yarn line! Please include me in the drawing! Just got Kristen’s book on color reading it as I type this so glad you have this pod cast on her, I saw her yarn line at TNNA this summer the colors are wonderful so many of them. Thanks Brenda Love your podcast. I really enjoyed your talk at LB in NY. I follow your podcast and Kristin blog. Thanks for the interview, for the wonderful pod casts and for the opportunity to try the wonderful colors Kristin created. Maybe one day I will be able to take one of her classes. Great colors make knitting even more fun. I really enjoyed the episode and the beautiful colors Kristin has created. I would love to learn to be fearless about color. I have loved Kristen’s bold use of color for years, but didn’t realize she doesn’t use black in her design until she pointed it out. What an interesting way to design. Thanks for the opportunity to play with her new yarns. Great episode! Loved the pix of adorable kittens on Kristin’s blog. This is wonderful yarn and I am so glad that CE will be distributing it. Looking forward to the next book! I love saturated color and was thrilled to hear that Kristen has a new line with CEY. I am also a huge blues fan and loved the closing song which I had not heard before, it really made my day! Thanks for a chance to win! Thanks for your great podcast, is it weird to say I like the audio quality. I have added Kristins blog to my list it will be a nice addition I think. For us it is getting to be warmer and time to take the sweaters off but I will knit on anyway. Two of my favorite fiber ladies, I can hardly wait to listen! I love Kristins design and color style and I am crossing my fingers that some of her beautiful yarn comes my way! Best wishes to you. Lovely postcard episode and I’d love to win the yarn. I LOVE playing with colour. Great podcast. Great yarn. Thanks for the contest! Loved the podcast! Hope I win some of your great yarn! Great interview! I’d love to try that yarn. Even though I love color, I seem to be stuck in a rut choosing the same color combos over and over again. I wish I could be more fearless. I’ve been reading Kristin’s blog for a while now. I enjoy it. Hi Knit Sib, love the podcast and was tickled when Kristin mentioned the latest ram from my state, Idaho! I am also a saturated color lover. What a treat it would be to win some of her yarn. Lovely episode! How’d you know this city girl needed a trip to the farm? I hope to catch you on your next tour of the U.S.! Love Kristin’s book on color and would love to try her yarn. Since my GD is in Maine, I will try to make one of her retreats. I really like the interview with Kristin. I am one of those people who have a fear of color – love it on other people but have a hard time pulling palettes for myself. I will have to run up to Webs to have a look at her new yarn. Oooh, I have Kristen Knits and loved making the Olivia Mittens with her Julia yarn. Enjoyed the podcast with her and am elated that the yarn is coming back!! I hope I am the lucky winner. I will make something colorful and beautiful with it!! Ooh, I would love to win some of Kristin’s yarn! Her farm just sounds idyllic – if I lived in the northeast I would so try to get to one of her workshops, but the airfare is a bit prohibitive. Thank you for the podcast, it was like having a mini vacation. I’d like to enter please. Great podcast! Enjoyed the interview! Would love to try these yarns. Another fantastic episode, Brenda! I felt like I was there at Kristin’s farm. The photo of her living room is just as I had imagined it would look. I am looking forward to more of your American adventure podcasts! Thanks for the great episode – and for the color inspiration Kristin gives us everyday! I love Kristin’s colorwork. Her designs are so liberating. I would love to have some yarn by kristin! Her patterns are stunning, and I am always inspired. Thanks for the postcard Brenda! Having Kristin paint my house is a fantasy!!! Winning her yarn would be a little dream come true! Thanks for the opportunity. I love the part about the lambs in sweaters!! What a great episode. Thanks for this wonderful opportunity! I loved hearing the sheep baa-ing in the background. What an interesting interview. Had to then go look at Kirstin’s colours. I grew up in a house with a beige interior. Beige everywhere, plain walls, no risks taken at all. I’m rebelling in my adulthood–I’ve got pink! brown! navy! green! everywhere. Love it. Not as bright and happy as Kirstin’s room, but still happy. Thanks for sharing the joy of color. Those colors are gorgeous! Super-saturated is definitely the way to go. Great interview! Please enter me in the yarn give away! Thanks! I really enjoyed hearing about Kristin’s life – and the resurrection of her yarn line! Enjoyed your visit to Kristin’s farm. Checked out the colors- cornflower my favorite. Loved the music and the episode. Enjoying the postcards so much! Love the music! I am already a fan of her books & yarn. Thanks for the contest! Love Kristin’s work she is such an inspiration to so many! I’m still learning about colour, slowly, it doesn’t come naturally to me. I’ve found it best to just jump in and try. NIce thing about knitting, if it doesn’t work you frog it and no-one’s the wiser… I love seeing how others approach colour. Very interesting hearing about the sheep farm and about Kristen’s yarn and books. Thanks! Wonderful episode. I would have loved to see the lambs and kittens..
Glad Kristin’s yarn line has been resurrected..
Great episode again Brenda! Thanks for keeping me company while I cleaned out my cabinets and pantry! I want to win the yarn! Great podcast episode! I loved learning more about Kristen and thanks for the chance to win some of the new “Julia”. Fascinating stories about farming, oh, and I’d love to see the lambs wearing sweaters! As usual, I loved the show. Your podcasts are so relaxing and I find it hard not to want to pick up my knitting when I am listening, but typically I am listening when I am doing things around the house or when I am at the office. Thanks for continuing to provide such a great listening experience. I loved the Julia yarns and would love to win some of Kristin’s new yarn! I so enjoy your podcast. I live and work in NY and listen on the subway on the way to work. Thanks! Great episode, as always! Have loved Kristin’s designs for years. As I know a little about farms here in the UK, it was fascinating for me to learn a little about farm life in the US, and the breeds of sheep Kristin keeps – oh, and a great sound track at the end, too! Thanks for another cracking episode. Great show, as always. I have been a fan of Kristin’s work ever since “Kristin Knits”! I would love to win the yarn assortment! Yarn assortments are so much fun! I was struck by Kristen’s comment that she rarely, if not ever, uses black or white as colors do not pop when paired with them. That’s such an interesting perceptive. I will have to take notice of that. Thanks for a lovely episode. Yarn AND food – what could be better? Love Kristen’s work – and your podcast! Great episode. Love that blues music. Really enjoyed the episode. Felt like we were at the farm. Thank you for all the hard work you do on each episode. What a wonderful episode. Loving the idea of the post cards. I would love to try color work and what a great opportunity to give it a try. I loved the interview with Kristin. Looking forward to seeing the yarn and checking out her books & blog. The color combinations are mind-blowing — and absolutely inspiring. Thank you! Always so glad I see you have a new episode! LOVE Kristen’s eye for color. Great color palette. I am a fan. Can’t wait to listen to this episode. Thanks for podcasting Brenda, each one is a little gift. Wow, Kristen’s use of color is fantastic. Thank you for introducing me to her work, I will definitely be getting some of her new yarn line. I know living on a farm is hard work. But it still sounds wonderful. I would love to win the yarn. I’ve just recently gotten into doing colorwork and would love to have this assortment. Thanks for a wonderful podcast Brenda. Truly my very favorite! Earlier this year, every other blog I read seemed head over heels about Brenda Dayne coming to the U.S. ‘Who is Brenda Dayne and why is everyone so excited?’ I wondered. I’m downloading Cast-On episodes 10 at a time from the very start until I catch up to everything I’ve missed. Your voice is friendly, soothing, occasionally whiny (‘I want an alpaca!’ you holler to the universe). Topics are of genuine interest to knitters. The music is fabulous and pertinent. Sweaters are always warm and beautiful. Listening is like knitting with friends even when no one is physically with me except my cat. Thanks for so much enjoyment! Thank you for the interview! What an inspiration. How is the house gutting coming along? Fantastic as always! 🙂 Thanks so much! pick me! pick me! her house is such an inspiration — reminds me of the set design in Nanny McPhee. Great podcast — thanks so much. Great podcast and great music. Thank you. Lovely episode Brenda. Your intro to the interview was so articulate. I looked at the yarn in a new catalog and it is lovely. Thanks for a chance to win. How nice to ‘meet’ Kristen and learn of her line of yarn and her life. I’ve visited her website and blog and will most definitely be looking for her yarns in my LYS. Great podcast/postcard, Brenda. I always love hearing the stories of fiber farmers. Great little episode. Thanks for turning me on to Kristin! Love your podcast! Can’t wait to try playing with color while knitting some socks – using your toe-up method, of course. I took your class in Alexandria, VA and I’ve only knit socks since. So glad you are back – and the ‘postcards’ are great. Lovely travel episode, I love them. Any thoughts of doing any more knitting / spinng archaeology ones? LOVE the green walls in the photo! How pretty. I’d love some Color by Kristin yarn! What a very charming and inspiring conversation with Kristin. I just loved hearing her “at home” instead of in a studio, so much more personal and real. It was a wooly audio version of “today’s sweater.” Thanks, Brenda. Lovely postcard. Thanks. I’m looking forward to hearing some postcards from Canada! Really nice postcard. Western Mass is one of my most fav places and I enjoyed the “ear candy”. Loved hearing about the lambs in sweaters, I must check that out. Beautiful colors. I’ll have to take a road when I am in Mass in November. Brenda’s voice and words are wonderful listening. Kristen’s colors are beautiful and if her yarn is the same as Julia’s yarn it will be a pleasure to use. Lovely episode from 2 of my favorite knitterati! Thanks. So glad when I find out you have a new episode available. I so enjoyed the postcard from Kristin, a little personal peek into someone’s life. It would be such a treat to get some of her yarn. Thanks for the opportunity. Well, I didn’t know that Romneys came from the Marshes… but Cheviots (Chee-vee-ots, if it’s promounced like the hills) won’t be so keen on wet feet? Lovely postcard! Great episode as usual Brenda. Kristen’s use of colour is sooo inspiring. Thanks for the great podcast! Brenda, loved hearing about Kristin’s farm and was thrilled to hear that her yarn line, which I’ve never had a chance to try, is back. Would love to win the goodie bag! Look forward to your future postcards–I took your class at the Lion Brand Studio so hearing this brings back fond memories of that afternoon. Thanks for a great podcast as usual and for a great giveaway – always love yarn! WOW. And here I thought my all-red bedroom was something daring! Really inspiring episode – thank you Brenda. Lovely episode – I’d love to see the lambs in sweaters. And her living room – the COLOR! I am working through my fear of color, and would love some lovely yarn to help… hint hint. 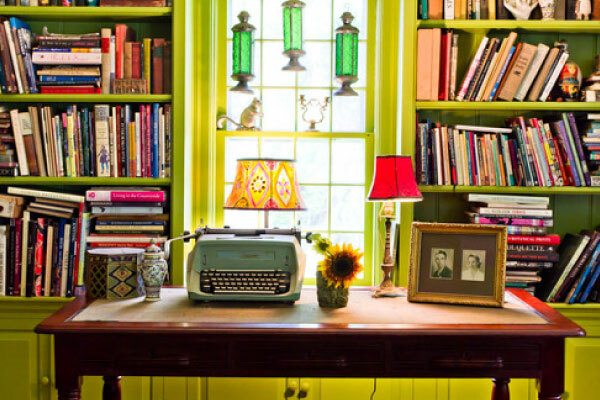 Oh my goodness – I just got lost on her blog *drooling* over all of the color in her house ! It’s awesome. Great show and great music. Thanks for all of your work. Really found this podcast most interesting & informative. Thank’s for another great podcast. I would so Love to have this fabulous Color by Kristin yarn. I didn’t see the pictures of Kristen’s house until after I’d listened to the podcast but, as usual, your words were evocative enough that I felt like I was walking through the rooms with you. It’s a real treat to have a knitter who is also a talented wordsmith to take us on such lovely journeys. Another fantastic episode! Thanks for all you do. And thanks for the chance to win some of Kristin’s new yarns. Love all the colors of this yarn! I could think of a lot of items to knit with it! Brenda- thank you for these lovely vignettes. Lovely episode as always. I’m one of those that can be a bit wary of colour – would love to change that with some great wool. Thanks for the contest. Love listening to the vignettes of your trip, almost as much as I loved meeting you at Stash! What a great gift!! Would love to be the recipient!!! Thanks so much!! I loved hearing about Kristen and her beautiful new yarn! I really enjoyed your podcast with Kristin, I have long liked her designs and am looking forward to getting her yarns. Color! Color! Color! What a wonderful experience to see the farm photo’s! Also, thanks for Doug MacLeod’s music. Love to hear Kristin. I have always loved her dynamic use of color. Would love to see pictures of her house and farm! Love colour and her colours look wonderful. Wonder if I’m too late? Anyway, thanks for the episode. Enjoyed it! I have been a fan of the Julia yarn, and may I say I love the descriptive color names! I’m glad that tradition is carried on in the new line. Just found your podcast. Would love to win this colorful giveaway ! I can’t believe I have never listened to a podcast before. This was great! I enjoyed picturing the farm as it was described and I was knitting! Interesting chat! Love all that color. Inspiring to knit to! Loved the interview with Kristin Nicholas. I could definitely use a workshop with her – I have never worked with more than two colors on a project out of sheer terror that my color choices will look like yarn barf. Hi Brenda! Kristin sounds just like my mother regarding all of her color. My mom is a master quilter and saturates all of her work with color~color ~color! I too would love to spend some time on the farm. Thank you for fun interview. Hey Brenda, I am glad you enjoyed your time here and the states. Thanks for the podcast from Kristin’s farm. I honestly don’t know how she manages the work and having time to be creative. Just discovered your site via Kristin Nichols’ Blog. What a treat! I’ll definitly be back. I’ve only recently found her blog and am inspired by her use of color and the combination of knitting and embroidery. Would love to make it to one of her retreats some day. What an inspiration! Thank you Brenda for lovely episode! Am I too late to get in on the contest???? Life on the farm sounds hard, but rewarding. And the yarn looks lovely. I love farm sounds and your descriptions of color. One day I’ll visit the East coast in the fall. Thank you! Your podcasts are great and they help pass the time when i can’t sleep! What neat ideas for postcard podcasts! Hi! I love your podcasts,wish they were longer. I grew up on a dairy/beef farm. I tried to get Dad to get sheep, but there was no money in sheep farming, he had 6 kids to feed. I have been knitting with Classic Elite when I can find it. I have also knit Kristina designs from her earlier books. Love her design approach. Did I miss it? I love the podcast, loved meeting you in Mpls. So glad Kristina’s yarn is coming back. Sweet. I enjoyed, very much, hearing the sheep-miss being around sheep and goats. Thanks for bringing them back to me. Made my first socks cuff down. Now tackling second pair toe up. Yet another learning curve – keep telling myself “Brenda likes starting toes.” So far, all I have is frayed yarn. I’ll get toes eventually. Love her new patterns. Have both books in the shop. Just so you know, I’m very anxiously awaiting your Halloween/Anniversary Podcast. I’ve been listening to your podcast for, well… since sometime in August I guess? I’ve been listening to it backwards (from most recent to oldest) and honestly, I feel like I’m old friends with an avid knitter! FINALLY!!! I learned to knit from Youtube a few years ago at age 24 and needless to say, no one I knew then was knitting. Now 27 and still no knit-freak friends by my side (though I now have a few who “knit around the holidays”), it’s nice to listen to you in all your Knitterly Geekery. I quite enjoy feeling like I’m not the only one totally ecstatic that I “figured out how to do the increases this way”. I can relate, you know? Anyways, just dropping a line hoping you read it one day when your podcast resolve gets tested- PLEASE DON’T GIVE UP PODCASTING!!! and yes, poutine is awesome. I know you take time and care to select the music that accompanies each podcast Brenda. And I wanted to say the bluesy tone of this ‘cast’s selection was good enough to purchase. Thank you for introducing me to this one and Enter the Haggis 🙂 and a few others along the way!